From the beginning, you know there’s something unique about New York socialite and heiress, Florence Foster Jenkins. At the arts club (which she founded) she appears in living tableaus as a variety of characters, including a Valkyrie. Between bits, she mutters that she hopes there’s enough potato salad, since everyone loves it so. We then see a bathtub full of the stuff. Florence is flighty, kind, and totally unaware of her lack of stage presence. It isn’t until after the show, when she is home and her husband, St. Clair Bayfield, puts her to bed that we know there is something extraordinary about this couple. Bayfield, still in formal attire, sits beside her in bed and reads poetry until she falls asleep. He lovingly removes the wig from her bald head, kisses her cheek, and whispers a tender good night. He then leaves their home and drives to another building, returning to the apartment he shares with his mistress. As the story progresses, we discover the reason for Bayfield’s dalliances. Played by Hugh Grant, Bayfield is a doting husband, determined to shield his beloved Florence from the bitter truth that her singing is atrocious. And even though they have a “don’t ask don’t tell” understanding about their unusual living situation, he goes out of his way not to flaunt it in her face or even hint at it. Grant has always been one of my favorite actors, but he often plays the same type of fellow: charming in a boyish kind of way and prone to scoundrel-like behavior. As St. Clair Bayfield, he still has those qualities, but he’s also more mature and facing the realization that his boyish days are far behind him. Bayfield wants to do the right thing, which is to protect and care for Florence. Meryl Streep, as always, shines in the titular role. Florence has lived her life in the shadow of loss, brought on by an illness from which she can never recover. Florence very well could have been a lonely, bitter woman. Instead, she chose to celebrate life, to live with joy, and to sing. “Life is music” has become her battle cry, and when she sings, she wields every song like a weapon to banish sadness and pain. It’s the way she attacks a song that makes her audience root for her. That and the fact that her inner circle ensures the audience is made up of friendly faces, some tone-deaf, some willing to take a bribe, and some simply so fond of Florence they can’t bear to hurt her. The real acting surprise, here, is Simon Helberg, who is best known for playing the harmlessly-leacherous nerd Howard Wolowitz on The Big Bang Theory. Here, he is Cosme McMoon, a pianist hired to accompany Florence during her singing lessons and, later, when she performs on stage. Cosme is a shy, soft-spoken man who is constantly surprised by the kind of circles he’s traveling in. He and Florence become fast friends, but when Florence decides she must sing at Carnegie Hall, he’s worried. It’s his dream to play the Hall, but he fears playing for Florence will make him a laughing stock. In the end, he must do what everyone who loves Florence does: Weigh his needs against what is best to support this generous and wonderfully eccentric woman. 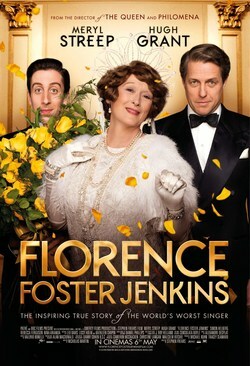 Warm, funny, surprising, and touching, Florence Foster Jenkins will lift your spirits and fill you with music. It may even want to make you sing.